Perhaps no other function of a free press is as important as the watchdog role-its ability to monitor the work of the government. It is easier for politicians to get away with abusing power-wasting public funds and making poor decisions-if the press is not shining its light with what is termed "accountability reporting." This need has become especially clear in recent months, as the American press has come under virulent direct attack for carrying out its watchdog duties. Upending the traditional media narrative that watchdog accountability journalism is in a long, dismaying decline, The Watchdog Still Barks presents a study of how this most important form of journalism came of age in the digital era at American newspapers. Although the American newspaper industry contracted significantly during the 1990s and 2000s, Fordham professor and former CBS News producer Beth Knobel illustrates through empirical data how the amount of deep watchdog reporting on the newspapers' studied front pages generally increased over time despite shrinking circulations, low advertising revenue, and pressure to produce the kind of soft news that plays well on social media. 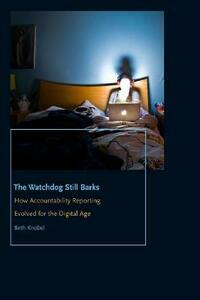 Based on the first content analysis to focus specifically on accountability journalism nationally, The Watchdog Still Barks examines the front pages of nine newspapers located across the United States to paint a broad portrait of how public service journalism has changed since 1991 as the advent of the Internet transformed journalism. This portrait of the modern newspaper industry shows how papers of varying sizes and ownership structures around the country marshaled resources for accountability reporting despite significant financial and technological challenges. The Watchdog Still Barks includes original interviews with editors who explain why they are staking their papers' futures on the one thing that American newspapers still do better than any other segment of the media: watchdog and investigative reporting.